We absolutely love this product! 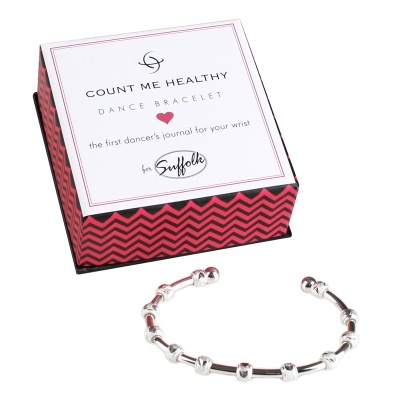 This bracelet serves as a beautiful dancer's journal for your wrist! Set a goal for yourself, and as you achieve your milestones simply slide the beads over to track your progress! Choose from the suggested goals included in the box, or set your own. Examples might be number of variations learned, number of weeks until a performance, number of glasses of water you drink in a day, etc. Silver fashion plated over white copper with heart-shaped etching. Attractive, durable box to store item when not in use.